You can make a difference in the lives of others by sharing your God-given gifts and talents here at GateWay City Church. Each week you’ll join hundreds of volunteer Team Members, ministering to others with the love and hope of Jesus Christ. 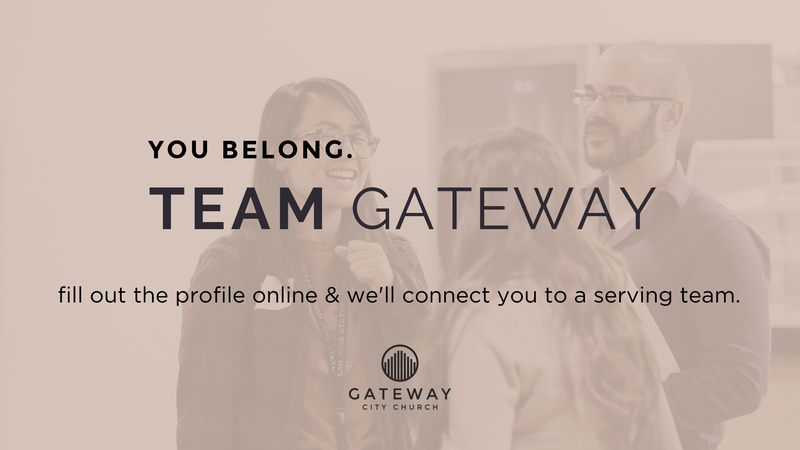 There is a place for you to serve with Team GateWay. Come join us! Simply fill out the volunteer team member profile below and a GateWay Team Member will contact you shortly. We look forward to serving with you. Come to our Team GateWay Rally September 23. It's going to be fun! We'd love to get to know you and help you find a team to serve on. Children's Ministry. If you have a heart for kids we'd love to have you on the team!